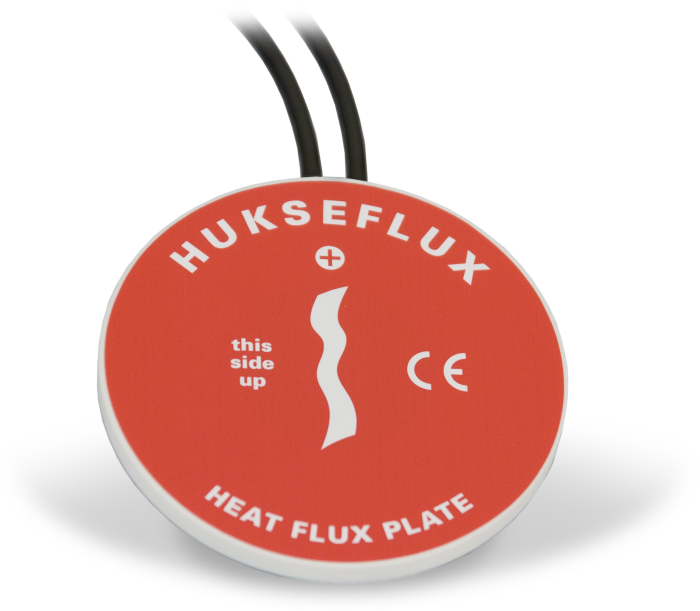 The HFP01SC, manufactured by Hukseflux, measures soil heat flux—typically for energy-balance or Bowen-ratio flux systems. It is intended for applications requiring the highest possible degree of measurement accuracy. The HFP01SC outputs a voltage signal that is proportional to the heat flux of the surrounding medium. At least two sensors are required for each site to provide spatial averaging. Sites with heterogeneous media may require additional sensors. The HFP01SC consists of a thermopile and a film heater. The thermopile measures temperature gradients across the plate. During the in-situ field calibration, the film heater is used to generate a heat flux through the plate. The amount of power used to generate the calibration heat flux is measured by the data logger. Each plate is individually calibrated, at the factory, to output flux. 21X (retired) An external relay (such as the A21REL-12) that supplies 12 Vdc to the heater is required when this probe is used with a 21X. CR10 (retired) An external relay (such as the A21REL-12) that supplies 12 Vdc to the heater is required when this probe is used with a CR10 with the silver wiring panel. CR9000 (retired) An external relay (such as the A21REL-12) that supplies 12 Vdc to the heater is required when this probe is used with a CR9000.